Shop the Lands’ End Back To School Sale to get 40% off all regularly priced backpacks and lunchboxes right now. No coupon code needed. Prices listed reflect the discount. Medium-Sized Backpacks start as low as $22.99 and lunchboxes start as low as $10.99. You can also get 25% off all regularly priced kids’ school uniforms with coupon code CHALKBOARD and pin #1415. For example, get the popular Boys’ Iron Knee Pants for just $22.50 after coupon code. 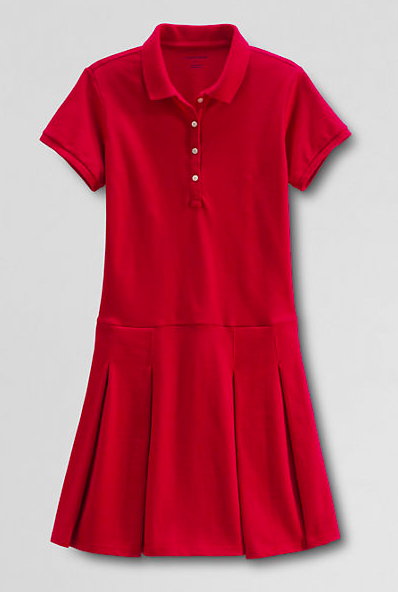 Or get this Girls’ Short Sleeve Polo Dress for $22.50 after coupon code. Shop the rest of the Girls’ Uniforms and Boys’ Uniforms. There are TONS of options.